The next couple of appetizers were a co-production with my sister for a family party. These seemed to appeal to the adults, but the kids were a bit put off by the green mush. I tried some of the leftovers out on a friend’s three year old, but the baguette croûtes were too tough for her. She licked the pea-purée off, held in her mouth for a bit, then spat it all over my dining room table. This puzzled me, because the pea-purée is pretty much baby food. Maybe three year olds aren’t great fans of garlic and Parmigiano-Reggiano? I thought these appetizers worked well. 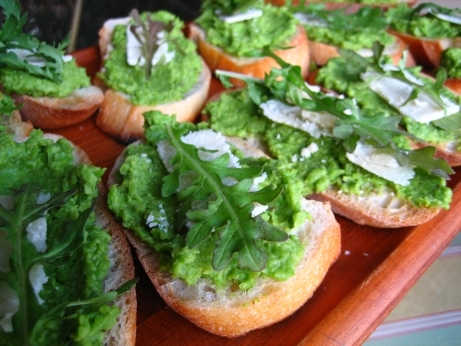 The pea-purée was flavorful with sweet roasted garlic, salty cheese, and lemon juice coming through clearly. Topping with a slice of Parmigiano-Reggiano and baby arugula leaf made for a nice colour counterpoint, and the baguette croûtes provided some much needed crunch. I’m always happy to find appetizers that transport well. I was able to mostly make these ahead, and then just do final presentation at the party. I made the pea-purée and croûtes at home, and then just had to slice the cheese and assemble them once I arrived. Unfortunately these were a little bit hard to eat, the croûtes tended to crack in largish pieces, and a couple of people dropped dollops of pea-purée onto my uncle’s carpet. He’s a neat and tidy kind of guy, so I cringed at every splat. I think using a smaller loaf would work better, maybe a baguettine, or a ficelle if they’re available. Pairing these down to one or two bites each would be easier on the wall to wall. The recipe warns that using fresh peas is a waste of time, as the frozen ones are much easier and will result in a less starchy dish. I used frozen but still found the pea-schmear starchy. I’m not sure if I undercooked them, or that’s just the nature of peas. I think a little more olive oil in the purée would have made a better emulsion, and the starchiness would have been less noticeable. I was quite pleased with these as appetizers. They were fairly healthy, very colourful, tasted pretty good, and didn’t take too too much effort. I’d certainly make them again. ah yes, the pea schmear. Hehehe, KC what were you thinking giving that stuff to a kid? Don’t they have delicate palates that may not react well to “sweet roasted garlic, salty cheese, and lemon juice”? Well this kid moastly eats veggie nuggets, cheese whiz, and peanut butter. so I like to try to push her boundaries and expose her to things she’d never get at home. Also, I’m insensitive to the needs of children.